Thank Goodness have been producing gourmet hand-made vegetarian foods since 2003. Go to our Facebook page to see Bernadette's videos. Our range is now wider, but our first products were nutroasts. The name came about because they are..
...versatile. Perfect hot or cold, or in sandwiches, or as burgers, etc., etc. ... good for your health. Nutritionally superb and containing no artificial additives. ... good for your pocket. No waste! Leftovers may be served cold - or refrozen and later reheated. ... good for the environment. Local ingredients where possible and all our packaging is easily recyclable. ... and they taste … so good! ..."Your nutroasts really are the nicest ever and I do know what I'm saying. I've had to eat my way politely through plenty of dry and flavourless ones over the years! My omnivorous friends love them too, with an onion and wine gravy. Our prducts are now available throughout Great Britain and Ireland. 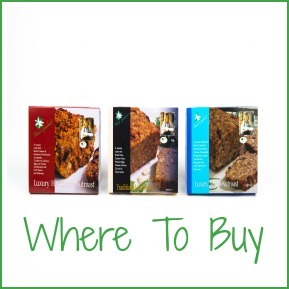 Our list of stockists may help you but it isn’t complete as the number is growing continually. Other retailers, caterers and hoteliers are very welcome to contact us for details of suppliers. Our nutroasts are currently available online from www.naturalgrocery.co.uk and arrive frozen. UK mainland orders which total £ 35.00 or more and are received on line will be delivered free of charge. Orders which do not reach the above values will attract a charge of £7.50. See the Natural Grocery website for more details. "Thanks so much for telling me about www.naturalgrocery.co.uk. What a wonderful website! We’re very pleased to announce that distribution in Ireland is being handled by Independent Irish Health Foods Limited. So far they’ve supplied over thirty stores, which are listed on our Stockists page. ..... we were delighted to be awarded a Great Taste Award for our Luxury Nutroast. in its "Savoury Six" list for Christmas. In May of 2017 we were asked by the supermarket chain Lidl to develop a nutroast recipe for them to use in their “Deluxe” range in the run-up to Christmas. We provided two and arranged for their production. Both sold out and we were very pleased that when the “Good Housekeeping” tasting panel tested 23 festive vegetarian offerings both were placed in the top 10. The Traditional scored 78% and came 4th; the reviewer wrote “Our testers couldn’t get enough of this caramelised cheese feast, and kept coming back for more”. The other recipe was placed 10th, with 71%. Not surprisingly, Lidl placed a repeat order in 2018. Recent news - Bernadette’s book published! In November 2018, Bernadette started to write a booklet of recipes called “A Dozen Ways With A Nutroast”, to help customers who don’t know quite how to present one or who don’t realise how versatile they are. 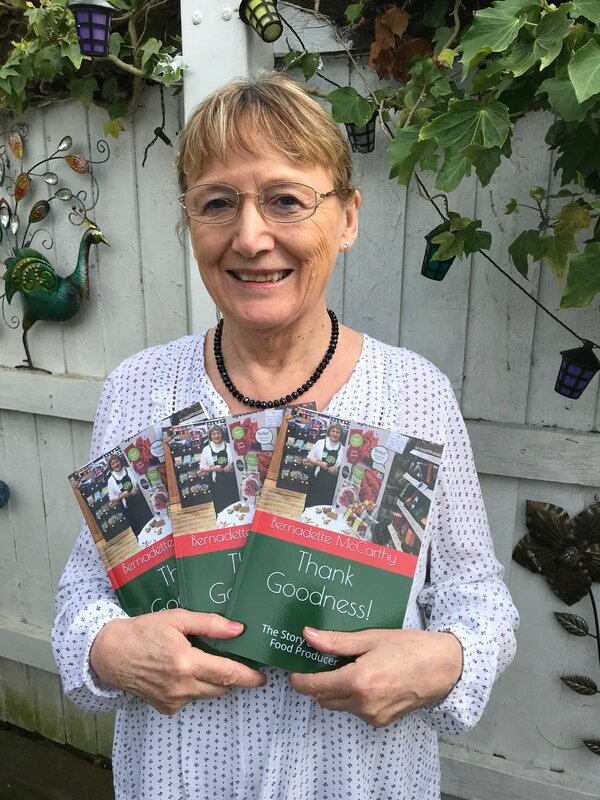 She began with a brief foreword about our business, just to give the recipes a bit of context - but once she started to write she couldn’t stop, and the introduction grew to sixty pages, called “The Story of a Small Food Producer”. It’s an honest account of our ups and downs, with plenty of humour and lots of photos, and after the Christmas rush we finished preparing it for publication. It’s now available, together with the recipes, from www.amazon.co.uk under the overall title “Thank Goodness!” The recipes range from pithiviers to burgers - in other words from the fancy to the totally straightforward - and they also include some succulent sauces and some nutroasts you can make yourself; our story should be of interest to any budding entrepreneurs, especially in the food industry; and all for £8.50 - less than the price of a pizza.